Thankfully I knew about the condition before purchasing - this computer was purchased by the previous owner in the early 90's with a view to using it as a second computer, but he had 'problems' with the PSU. He could not recall what the 'problems' were (I'd guess possibly just conversion to UK voltage?) but apparently it needed to be replaced, which never happened, so this became a donor machine to keep his other BBC running until the late 90's - hence the missing ICs. He's not seen the PSU has since the early 90's and suspects it was binned at the time. Time for some 'before' pictures. ...until you take a closeup look around the TV modulator! The corrosion-like mess in the third picture looks very concerning, but having washed and scrubbed the PCB yesterday I suspect this is actually the result of the Beeb having been used as a mouse-toilet for the last few years! In fact, after cleaning there doesn't appear to be too much track damage, but the modulator may have to go. More pics of the cleaned machine, later today. For now, I need some help - does anyone have details and schematics of the US beeb? In particular what changes are needed to convert back to UK spec? (so I can check if this has been done - but as it still has the US operating system chip, I guess not?). Also, I'm fairly certain I can get hold of missing chips (pics from Chris' Acorns should help identify these) - but I'm more worried about the PSU and what can be done to source a replacement, because I'd doubt anyone has a spare US beeb PSU lying around... Any thoughts? The power supplies are universal, in that there's a 115V link to make for that Voltage. Contact Mark, at Retroclinic, he'll have a spare power supply. He may have some/all of the ICs you need too - and maybe a replacement modulator. The fun will start when you have everything assembled and turn on for the first time . . . Good luck and don't forget to keep everyone undated with your progress. daveejhitchins wrote: The power supplies are universal, in that there's a 115V link to make for that Voltage. Contact Mark, at Retroclinic, he'll have a spare power supply. He may have some/all of the ICs you need too - and maybe a replacement modulator. Hi Dave, I had hope that was the situation, but unfortunately not. The US Beeb PSU had a different casing design which forms part of the rf shielding that encases the pcb. Unfortunately the original beeb PSU just doesn't fit (I've tried ) and if it did, it would be open on the right hand side exposing the live psu components. steve3000 wrote: but unfortunately not. Ooops! . . . What do I know . . . Mark may be able to help, anyway? daveejhitchins wrote: Ooops! . . . What do I know . . .
Haha, well I had assumed the same too, and had got a far as pulling the psu and most of the ICs out of my issue 3 beeb to try on the US Beeb, when I noticed the problem! As you can see from the photo at the top of the thread, the insides of this US Beeb were a little nasty, having been used as a mouse-toilet for several years! Only one thing left to do (after fitting the 0v cables and keyboard)... Power on! ...or at least it worked...briefly...! Not bad I guess for the first time powered up in 25+ years (this computer was used as a donor computer in the 90's when previous owner had issues with the PSU - hence missing ICs, but it may also have had fault(s) at the time...). Anyhow, the computer no longer functions sadly it only booted up 3 times, and now gives a long Beeeeeeeeeeeeeeep of doom. Possibly relating the above memory issue or further issues? Might it have had its ULA swapped at some time? Does it even have/need the invention mod? Good question. Fitted a ULA to get it running. No idea if it has or needs the mod - pcb is a different layout which might make it difficult to tell, and dates from 1983, if that helps? What do I need to look for? Also, does anyone know of any fault-finding information for the US Beeb? The PCB layout is completely different, along with the IC numbering and link numbers, and very few chips are socketed - similar to issue 7 beebs. So if there's a list somewhere of US Beeb IC numbers or link numbers, that would be really useful. I'm assuming the circuit itself is pretty similar, if not identical, given that it runs normal Beeb software...(at least I'm hoping it will, when it is working!?). Some of the ULA models have inverted output compared to another, but I don't know which are which. I believe the mod is to flip the invert signal coming in, but I could be completely wrong about all of this. I think my"debug OS" room image would still work, but I don't know how the RF and composite encoders in a us beeb will like pal 50p timings. I can't find the link, but if you can burn an eprom, it displays different modes while playing sound and toggling the cassette relay and LEDs for the first few seconds. It's most useful for spotting dodgy ram chips. More info on the Video ULA / Videoproc here. I found when repairing my German Beeb (same as a US Beeb). same as a UK Beeb? Ah, that makes sense - I've already started a list of ICs and links, mapping them back to those on an original Issue 7 beeb - most of the ICs are easy, but the links are more challenging! In fact I think the MODE 7 issue I have may be due to incorrect link settings for the VidProc, but I can't find what the links should be anywhere. I've tried looking at all the photos of US beeb PCBs I can find online, but none are high enough resolution to see all the links and determine their positions. 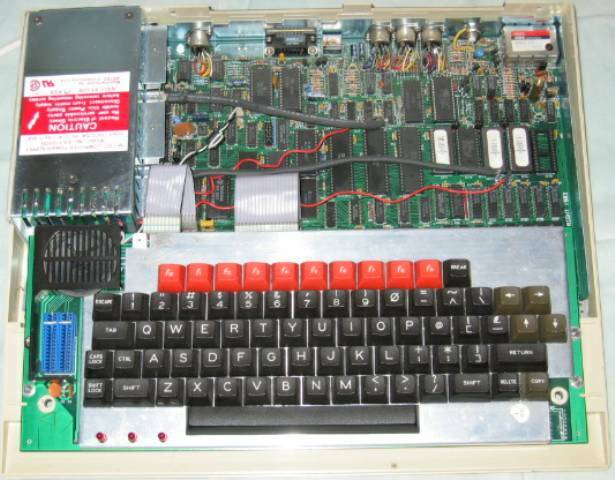 Do you have a high resolution picture of your working German beeb PCB with links in place? This could be really useful. It's likely that 95% of the circuitry of a USA Beeb is the same as a U.K. Beeb. This of course would take a long time. So you may want to start off by tracing the connections for the links first. In fact I think the MODE 7 issue I have may be due to incorrect link settings for the VidProc, but I can't find what the links should be anywhere. like the UK beebs that had the "hidden" wire on the underside. I'll take one when I get chance. And here's a photo of the UK motherboard in the North American case with 115V power supply. All working well! And I put the speech ROMS in the UK motherboard - no Kenneth Kendall, it speaks with an American accent! Those are impressive GND wires! 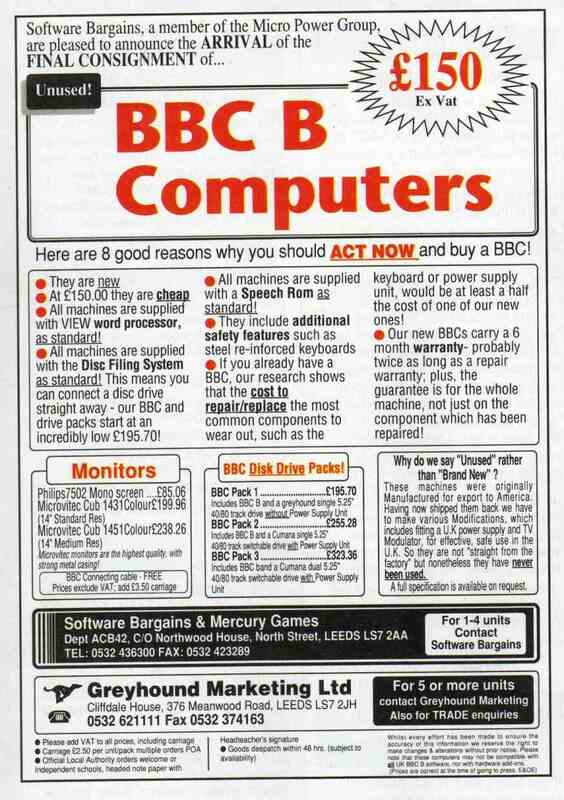 However, I was recently forwarded some scans of a 9-page document about how to prepare re-imported US spec BBC computers back to UK spec. Great to see some original documentation mentioning some of the differences between the UK and US spec. Shame there is no circuit diagram though! Interesting to see this was prepared by Geryhound Marketing Ltd. - perhaps they were involved in the re-importing of these back to the UK? Last edited by steve3000 on Wed Nov 21, 2018 11:09 pm, edited 1 time in total.